As Toronto’s population increases in density, it places more pressure on ever-shrinking resources, including public space. The use of laneways in the city to increase public space offers the opportunity to release some of this pressure. ERA’s Annabel Vaughan moderated a panel discussion on November 30th on just this subject. Organized by The Laneway Project, panellists included Jake Tobin Garrett of Park People, Jessica Myers of the Junction BIA, Jonathan Morrice of Toronto Police Service’s 55 Division, Mark van Elsberg, Public Realm Section, City of Toronto, and Monica Wickeler, a visual artist who works in street art and murals. 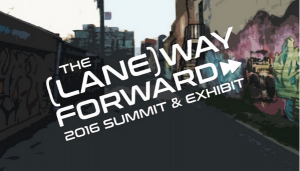 The Laneway Project – a not-for-profit corporation – champions change, initiating action through a grassroots approach, specializing in ‘tweets to shovels’ social media activism in the realms of planning, urban design, architecture, landscape, communications, research, community engagement and public policy. They would like to see a time-based sharing of spaces: to push laneways to offer an ebb and flow as dynamic, multi-purpose community spaces over a 24-hour cycle. Laneways lie on the marginal edge and are often associated with crime, however they are vital as potentially thriving public spaces. Toronto often lags behind other international centres when it comes to optimizing our public space. An interesting precedent is Detroit’s TAP (The Alley Project), where garages host street art workshops and animated laneways are adorned with graffiti, creating spaces to engage youth, ultimately changing the focus of their use. The City of Toronto aims to facilitate stakeholder-driven, incremental interventions of a similar nature, seeking out opportunities to revitalize and enliven existing laneways. This has included limiting parking to enable restaurants to set up licenced patios in alleys, reinventing micro-retail environments, developing parking spot parklettes, retaining historic laneway networks, developing guidelines for housing, and supporting laneway innovations hosted by BIAs and communities as part of the public realm. The panel successfully fleshed out these opportunities; for Toronto, the conversation is just getting started.